For such a pretty looking salad, I thought the taste was a little disappointing. Not that it wasn’t enjoyable, but I was expecting the flavours to explode in my mouth, and it was more like … well, … a *pop*. Still, it’s something different, so worth a try. 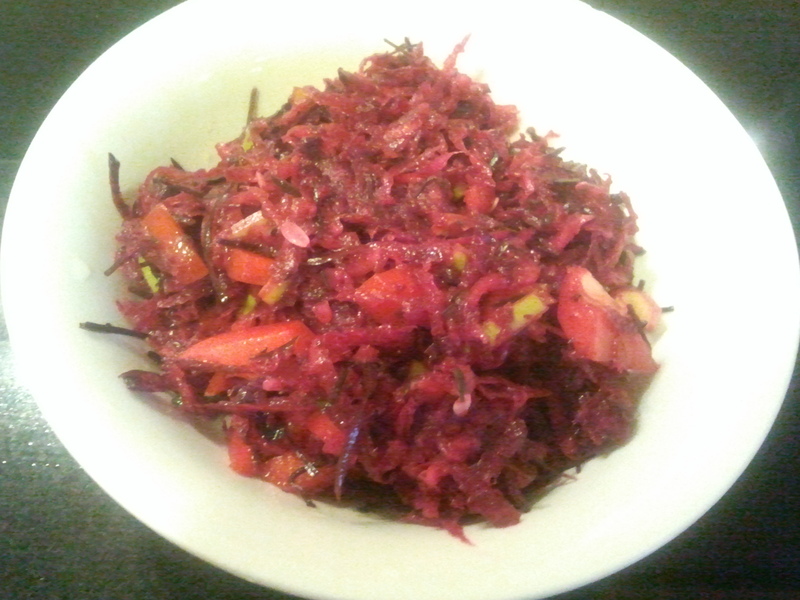 You never know, you may just love raw beetroot! Soak arame in enough water to cover it for 5-10 mins or until soft. Discard the soaking water & chop roughly. Sprinkle the salt on the diced cucumber and let sit for 5-10 mins. Dice or grate the other ingredients and place in a bowl, add arame, cucumber & the mixed dressing and toss the salad thoroughly.